Valentine's week is here, which means it is time to put together an outfit for a date night with your man, or a Galentine's get together with your girls! I know that some people are not necessarily a fan of Valentine's Day, believing it to be too commercial, but I personally love any chance I can get to celebrate anything! Even when I was single, I would spoil myself with a box of chocolates and binge watch movies like it was my job! This Valentine's Day is a special one for me, for it is the only one my fiancé and I get to celebrate while engaged! This is our third Valentine's Day together, and we are sticking with our favorite way to celebrate - eating! We always love to dress up in a classy outfit and trying a new, fancy restaurant that we would not normally go to on a daily basis. This may be a cliché for Valentine's Day, but it is cliché for a reason! Who doesn't love dinner dates? For those of you going out on Valentine's Day, I have styled two dresses from Maggy London for the lady who likes to look beautiful and classy! The first dress I styled is the Red Sasha Midi Dress, which screams Valentine's Day! 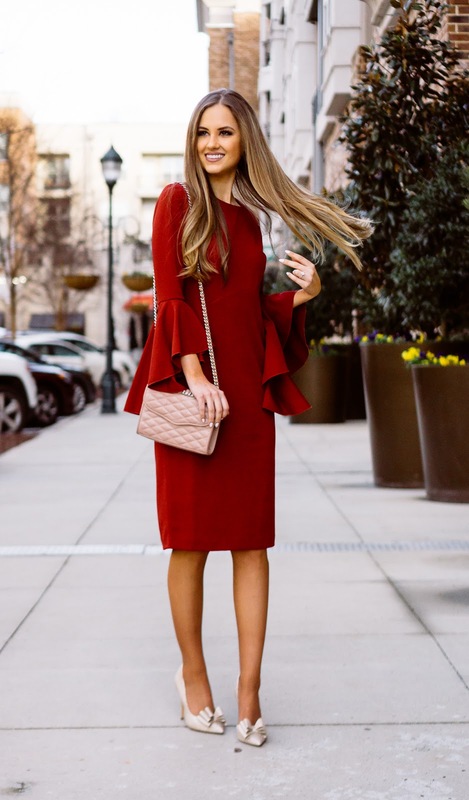 I love wearing red for special occasions, and the flared sleeves on this particular dress adds a little drama, resulting in an eye catching look. Even though the dress is midi length, the red color gives you a little bit of sexiness, especially when paired with pumps! For the second look, I wore the 'Tawny Fit and Flare', which is a cold shoulder black, lace dress. This dress is perfect for the gal who wants to dress up, but is not a fan of wearing your typical pink or red on Valentine's Day. The cold shoulders, lace details and knee length design adds a little spice to this otherwise modest dress. I also love that this dress does not scream holiday and can be worn to several other special occasions and events. I often find myself buying items that are holiday specific and can only be worn once a year, but this dress is a timeless piece that can be worn over and over again! I hope you all loved these classy Valentine's Day outfits! Leave me a comment down below me which outfit is your favorite!